Below are upcoming workshops, presentations, or events. Most events require registration in advance. This allows me to tailor my events to meet the needs of each group and provide the best quality experience. As always, please reach out to me directly with any questions, or if you wish to register (719-679-8012). It can be difficult to know what to say or do, or even begin to understand their experience. 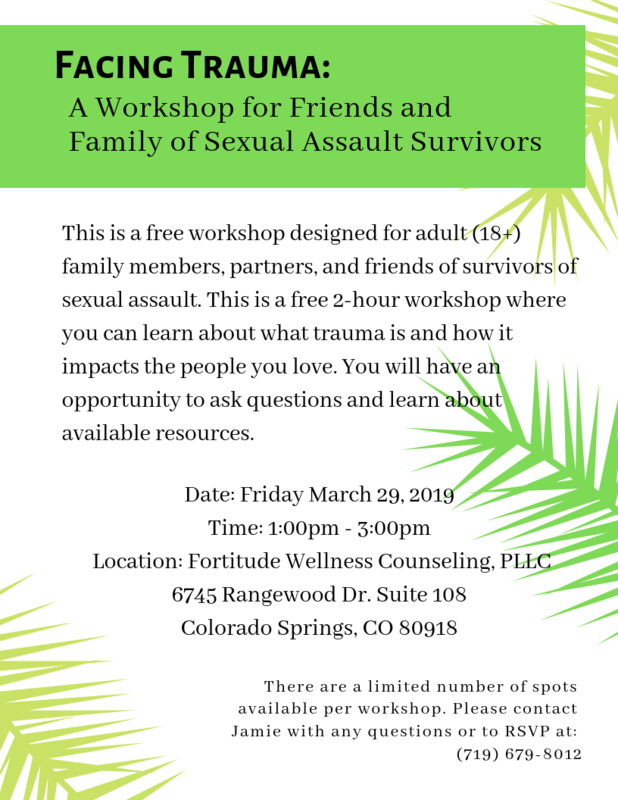 In this 2-hour workshop, held periodically throughout the year, you will learn about trauma and how it impacts the person you care about. This is a space for you to learn more as well as ask questions the survivor may not be ready to respond to. Sexual assault can be a difficult subject for many people to talk about, but here, nothing is off limits and my objective is to help you feel more prepared to support your loved one as they work through their traumatic experience. This group is appropriate for any adult - parents, partners, adult siblings, friends, coworkers, or any other type of relationship.